Venezuelan opposition leader Juan Guaido at the Caracas house of his chief of staff Roberto Marrero last Thursday shortlly after Venezuelan security agents arrested Marrero. Most of the news from Venezuela in recent days is not encouraging for the restoration of democracy there. Late last week President Nicolás Maduro's regime arrested Roberto Marrero, the top aide to opposition leader Juan Guaidó - whom the U.S. and 50 other countries recognize as Venezuela's legitimate president. Then on Sunday, Russia flew a military advisor and 100 troops into Venezuela to support Maduro. WLRN's Luis Hernandez spoke with Americas correspondent Tim Padgett on Sundial about the latest developments. HERNANDEZ: Update us on the arrest of Guaidó's chief of staff, Roberto Marrero. What do we know about where he is at the moment? PADGETT: We know that he's in the hands of what's called the Sebin, the intelligence security agency in Venezuela. That's all we know. Late last week, they raided his home, took him away and it's had a chilling effect. This is the biggest attack that's come yet on Guaidó’s people. But on the other hand it's sort of galvanizing Guaidó’s supporters. There was a huge rally over the weekend out in the eastern part of Venezuela as a response to this. READ MORE: After Border Bust, Will U.S. and Guaidó Stop Rattling Sabers - and Let Sanctions Work? And is there now a fear that they will arrest Guaidó? Castro was so bugged out by this - but he didn't arrest Payá. He ended up arresting everybody around him, about 75 people. But he did not throw Payá in jail because he knew that would cause such an international backlash that it would create too many problems for him. So I think they're using the same M.O. in Venezuela right now. They're going to arrest a lot of people around Guaidó but not Guaidó himself. The Cubans did not arrest Oswaldo Paya 16 years ago because it would have caused too much international backlash, so they arrested everyone around him. I think the Venezuelans are using the same M.O. with Juan Guaido. In hopes of stopping Guaidó, slowing him down, shutting him up? As I said, having that chilling effect on his movement. So they keep Guaidó out of jail and they can say, well, we didn't arrest Juan Guaidó - but by arresting everyone around him it keeps that thought in the air that, at any moment, we could arrest Juan Guaidó if we wanted to. After the news of Marrero’s arrest the U.S. tightened sanctions on Venezuela, this time on the national development bank. What can you tell us about this move. What does it mean to Maduro? Not much. We have really spent the most powerful sanctions already, and the most significant being a few weeks ago, you'll remember, when we essentially cut off oil imports from Venezuela because we fixed it so the revenues from that oil would not go to the Maduro regime. It would go to an escrow account that goes to Guaidó and his presidency when and if he becomes president. So all the sanctions that come after this now, like the one on the development bank that you just mentioned, they could cause some discomfort. But this is all minor now compared to the big bullet a few weeks ago. What we're doing really more than anything else now is waiting for that one big sanction that I just talked about to work. And it could very well begin to start showing its effects on the Maduro regime. Last week, for example, or this month, was the first time ever that we've essentially seen no Venezuelan oil being imported into the United States. That's a huge thing. So I think at this point the United States and the opposition in Venezuela and the rest of the world just have to sort of sit back and wait to see if this really does undermine not just the financial but the political health of the Maduro regime. Venezuelan President Nicolas Maduro (left) visiting Russian President Vladimir Putin in Moscow in December. And Russia now sent two planes into Venezuela with a military advisor and a hundred troops? 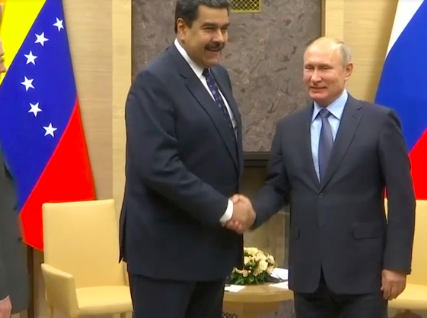 Russian President Vladimir Putin has a very strong interest in seeing regimes like Maduro's thrive in Latin America because they oppose the United States. Putin wants to undermine democracy in this hemisphere. And so he has been supporting regimes like Maduro's, like Nicaragua's, as a way of undercutting United States influence. And these two planes that went yesterday into Venezuela are a perfect example of this. Trump To Meet Caribbean Leaders At Mar-a-Lago. Will He Pony Up With Fuel? On Friday, President Trump will meet with leaders from five Caribbean island nations at his Mar-a-Lago resort here in Florida. A big question is: what will Trump do for them in return for what they’ve recently done for him? Is Venezuela's Financially 'Desperate' Regime Secretly Hawking The Nation's Gold? The Reuters news agency reports this week that Venezuelan President Nicolás Maduro’s regime is secretly spiriting tons of gold out of the country. It’s one of the few sources of hard currency left there. But experts here say it may keep Maduro propped up for a while. The Venezuelan-Colombian border erupted in clashes Saturday between anti-regime protesters and pro-regime security forces, as Venezuelan opposition leader and widely recognized interim president Juan Guaidó hoped to help push tons of humanitarian aid from Colombia into Venezuela past military blockades.